The white linen suit and odd trousers are getting ready to be drycleaned and stored for the duration. The spectator shoes have been relegated to the higher shelves. The seersucker and madras trousers are pressed and waiting to be swapped with the heavier woolen ones that haven’t quite made it down from the topmost hanging bar in the closet. It is September, that mixed month of cool nights and warm days. Did I just write warm? Today the mercury will register 91ºF, if the predictions come true. It is hot enough for you? It is for me. And that presents a unique problem when one is overly concerned with the trivialities of elegant dressing. For what items of clothing will one reach given the fluctuating temperatures during these post-Labor Day weeks? Here is where I break with tradition. If it is hot enough to require air-conditioning, it is hot enough to continue to take advantage of summer weight fabrics. During the day, I continue to wear linen trousers and lightweight sportscoats. For the most part, I stick to darker colours, though. Navy linen trousers, or black for evenings. Patterned cotton trousers in shades of cream and brown, black and tan, black and white and plain old lightweight khakis (“chinos”) do nicely in this weather. Most often I pair them with a white, very light blue or pale pink shirt. The coats are navy blazers (single-breasted), or wheat with a light blue overplaid, or dark brown Prince of Wales check. But what about those days which require something more formal? 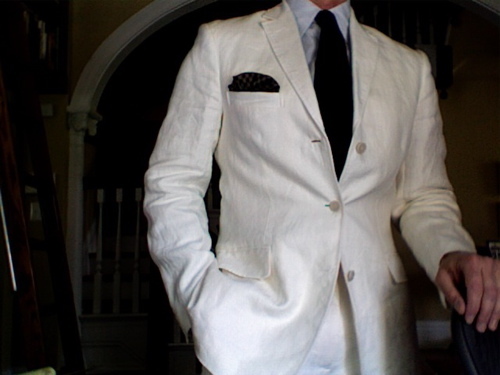 I am not so fortunate to own a suit made of fresco — an open weave wool which allows air to circulate and cool. But I do have a couple of lightweight and lighter coloured wool suits the jackets of which are half lined. At roughly 7 1/2 oz., they are as flimsy as a politician’s excuses for accepting certain campaign contributions. Wool, is a natural wicking agent and can be quite comfortable during these days. The trick is to let your clothing rest a day or two after having worn it, preferably in a place where it can catch the breezes and air out a bit. Footwear doesn’t change that much. Socks are lightweight wools or cotton. I like to wear unlined suede shoes, which breathe well and are unexpected as most people think of suede for Fall use only. Add a lightweight scarf or linen sweater for evening and you’re ready for anything. Being well dressed requires a constant commitment to trying to be well-dressed. Eternal vigilance is the price to pay. Yes, it’s a challenge, but with a bit of forethought, careful editing and commitment, you’ll stay ahead of the game. Does all this mean that you should cease and desist? Not at all. In fact, I think that if you made all white your signature look (especially for my women readers. We already have Tom Wolfe… ), it can work in your favour. (Well, maybe not white shoes worn all the time. And that would mean handbags that match…) As long as your clothing is in good repair, fits beautifully and is well-cut for your figure, you will be putting your best foot forward. Or, in other words, keep fighting the good fight. 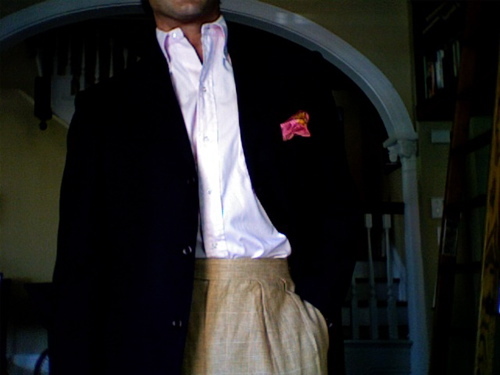 This entry was posted in Elegantology and tagged dressing for the heat., tailored clothing. Bookmark the permalink. 15 Responses to Hot Enough for You? Although I do enjoy the early fall, dressing this year is eternally difficult. It’s too hot for most of my wardrobe, but, since it’s technically “fall”, most of what I’d like to wear is no longer appropriate. I wish the “no white/madras/linen/whatever after Labor Day” rule could be ammended to “after the first official day of fall”. Life would be much easier. Thanks for the Feinstein/Sinatra post as I missed reading it in my NYT. I love both guys (well, actually early Sinatra; pre-1960s) and this should be a great album. Whoop … showing my age! But most of all thanks for turning me on to a new publication (as if the cost of WoI and Selvedge wasn’t already breaking the budget). As a former graphic artist/illustrator it looks like a real find. Do you remember George Stavrinos? I still have illustrations of his that I saved from the NYT and elsewhere. If there was ever a book for what to wear, you my dear, would be the perfect candidate. I always admire your easy, yet elegant approach. More men should heed your advice. I would look twice. Hi LuLou! It used to be “no white shoes” as I understand it… Fall back and fall into your cooler weather clothing would be easy to remember. Hello Linda, I, too, spent too long looking at the hanging clothes this am. I don’t remember Mr. Stavrinos (but may recognize his work. I’m horrible with names…) Congratulations and welcome to the blogosphere. You are a graphic artist, aren’t you? Only… you write copy, too… hmmm. Nice work! Thank you Mrs. PvE. It has taken a while and I’m still learning. However, I am beginning to believe that I have seen the end of an error (or two.) If only my outside were as perfectly beautiful as your inside… hmmm. Sounds dicey. “art/heart?” Well, you get the drift. It’s a wonderful outfit and why shouldn’t you wear it this week. Summer whites would raise eyebrows this week, but that outfit says easy and elegant in the nicest possible ways. I am going to try and get my husband to read your posts. You are always spot on. I always look forward to the fall and cool weather clothes, but this transitional time is difficult. I try to bridge over with light sweaters. But I think is time to go shopping! I know! What’s with the heat. It had just been perfect out these days. But alas great post-labor day look. Love it. Thank you, Brian, katiedid and porter. Good enough for the optometrist at any rate… it was dark. The trousers are the second pair I recently had made and are extremely comfortable. Now for a serious question, how do you prevent the cleaners from ruining all your linen clothes (not pressing to death)? What good looking men’s duds you have featured! I just love for my man to look suave and debonair! He has excellent taste and I can’t wait to show him your blog! He will love it! I live in Southern California and have, probably, two more months of 90 plus weather (plus a wildfire or two thrown in). I wear what is comfortable for my environment, not what someone made up as a “rule” decades ago. Today, I wore a white cotton button down with linen trousers and left the jacket at home. It was 99. Welcome MIMILEE, and thank you. Feel free to chime in with some of your husband’s favourites, too. I’m off to have a look at your work! A voice of sanity in a world gone mad. it is an interesting question how far men would retain their relative rank if they were divested of their clothes..